Do you know your padlocks from your deadbolts? This may seem like an obvious comparison, but locks can come in many shapes and sizes. Different lock types will be better for specific types of properties, while others are advised against for certain doors. They may also be relatively simple or quite sophisticated, affordable or expensive, electronic or manual. See what we mean? With so many choices, it’s hard not to feel overwhelmed when choosing the right lock to protect you and your valuables. Whether you are looking to upgrade your home’s security or your commercial building could benefit from a new set of locks, you should ask your local locksmith to help you select the right fittings for your property and budget. Before we get to that, though, let’s take a quick look at some of the most popular lock varieties out there. These are your standard residential door locks, installed in both internal and external doors. Knob locks comprise a key cylinder on one side and a turning knob on the other, offering you your staple home security basics. They shouldn’t be used as standalone protection as they are very easy to force their way into. A secondary lock like a deadbolt should be fitted alongside these to ensure your property is adequately safeguarded. Padlocks are unique in that they are the only ‘portable’ locks you will find in a residential property. They can come in different sizes and variations are not attached to a foundation. All padlocks have three main components: the locking mechanism, a shackle and the body of the lock. Additionally, there are two types of padlocks you can choose from – keyed and combination. You can probably guess the difference between the two padlock types: the former is opened with a key, while the latter relies on a special code. Not only that, keyed padlocks can also come in key-retaining and non-key retaining options. Once you have opened a key-retaining padlock, the key will stay in place until you lock it again. If you want a bit of flexibility with your keyed padlock, opt for one that doesn’t retain the key. - Single cylinder deadbolts: The most common type around, these have a key cylinder on one side and a turning thumb knob on the other. We wouldn’t recommend these around glass doors, as someone could easily break the surrounding glass and reach around to unlock the deadbolt. - Thumb turn deadbolts: Very similar to single cylinder – the point of difference is that these have an additional lock for their inner turning mechanism. - Double cylinder deadbolts: More complex than a single cylinder and thumb turn, these comprise a key cylinder on both sides of the lock. While they provide you with heightened security, they could make emergency evacuations more difficult. - Keyless deadbolts: These are activated by code, making them much harder to break into. The downside is that these can be more expensive than other deadbolt types. A popular choice in commercial properties. With these locks, you have a lever that has been especially designed to open and close easily – something that is crucial in a building with a high foot traffic. Once the lever is swung up or down, a bolt is released to quickly open the door. Like your residential knob locks, a lever handle lock will a rotating door knob on one side and a key cylinder on the other. Mortise locks are a two-in-one component, combining a non-locking spring latch that is controlled by a lever, and a deadbolt locking mechanism. That dual action makes these locks significantly stronger than most locks – meaning they are much harder to break into. With that said, they are also harder to install into a property too. These are simple locks used to secure low-level devices like filing cabinets and lock boxes. The “cam” is a small tailpiece that keeps these locks secure. A key is required to take the cam out of, and back into its slot. Like we said, contacting a lock and key services provider will give you a lot of clarity over your security. Seasoned pros have installed and replaced these several times, and they will know exactly what type of lock is best for each type of property. Many locksmith businesses these days won’t charge you for a consultation, and they won’t pressure you into making a rash decision. We want to emphasize that, because every industry has its scammers, you should choose your locksmith professional wisely. Always hire a local business with a fully verifiable address – and run away from any operator that refuses to give you a full business name and information on licensing and insurance upon request. Locksmith services seldom cost several thousand dollars, so make sure to ask for a full cost breakdown of the options you are considering for your property. Are you looking for a locksmith business in Atlanta, GA? Then you’re in luck! Atlanta Fast Locksmith is more than happy to help you find the right locks for your property – whether you are a local homeowner or you own a business in the area. Get on the phone with our licensed and insured professional to inquire about our services and we will provide you with a full price quote, free of charge. Regardless of where you live or the type of property that you own, we hope that this basic guide to the various types of locks will help you better understand some of the options you can select from. 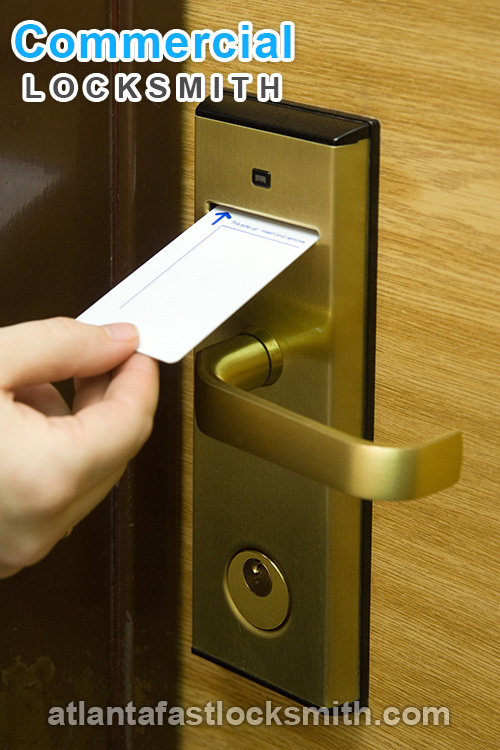 Make sure to contact your trusted locksmith professional to find out more about your protection.